Hushcloth® Acoustical Foams (HC) can be purchased in rolls or sheets, and can be CNC, Waterjet or die cut, or fabricated to customer specifications. They are easily cut with a knife, saw or scissors. The addition of pressure sensitive adhesive provides a convenient method of fastening to most substrates. All Hushcloth® products can be made in combination with Whispermat™ barrier systems when both absorption and transmission loss is needed (see Whispermat™ brochure), or VE damping systems, when enhanced vibration control is required. (see VE damping brochure). Hushcloth® Acoustical Foams are either Polyester, Polyether semi-reticulate foam, or Melamine optimized for sound absorption. Hushcloth® Acoustical (HC) foams are designed to provide maximum absorption of airborne sound with minimum thickness and weight. 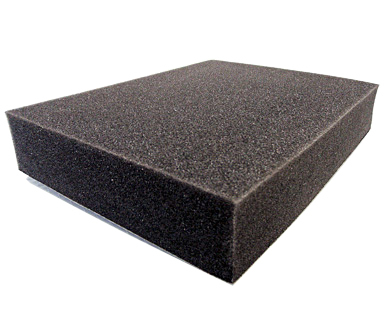 These flexible polyurethane open cell foam products are manufactured to optimize pore size, air flow resistance, and density. Many applications require these products to be subjected to environments such as dirt, moisture, chemicals, and abrasion that could be hostile to an unprotected foam. American Acoustical Products has developed various surface treatments to protect the integrity of the foam from these elements. These facings will increase the absorption properties at certain frequencies as well as provide a cleanable, decorative and durable finish for a wide variety of applications.